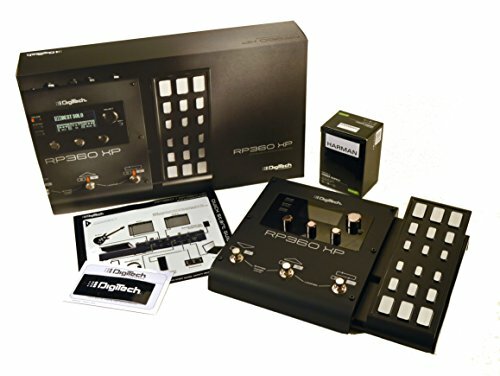 Digitech have a long-standing reputation as a quality brand when it comes to multi-effects units, and it’s rare that such reputations are baseless. Their RP360XP is their intermediate model, and it’s an impressive piece of kit. The number of features they have managed to cram into this little box is insane! Seriously, if they put a set of wings on this, I’m sure it would fly! It’s going to be tough to cover everything the RP360XP offers, but I’ll certainly do my best to highlight the key features, in terms of parts, construction, tones and playability. Without even looking at the features contained on this multi-effect unit, we can see that it’s made from a metal casing. This is predominantly what brings such a processor out of beginner level products, and into intermediate. The materials and craftsmanship required for a metal casing will be greater than that of plastic. Looking good so far. These specs pretty much check out for something in this price range. Let’s get a better idea of what’s going on. I’d put this as being a good choice for intermediate guitarists. The metal casing would provide the durability for somebody who’s gigging in local bars. I’d say it would be particularly ideal for somebody in a covers band, who has a wide range of tones that they need to cover throughout the course of their set. It would also work for guitarists who are still exploring effects, and prefer the functionality, cost-saving and space-saving aspect of a box like the RP360XP, rather than starting a collection of individual boxes, amps and cabinets. Guitarists who know what they like will probably have refined their sound enough to have individual boxes. I feel like I’m writing too much about the metal casing. What can I say? It’s an important part of the build and a key selling point for the unit. It separates the gear from the toys. The footswitches are also sturdy looking metal ones, a feature carried over from the cheaper Element model. The knobs for tweaking effect parameters are finished with a brushed dark chrome that looks the business. The back panel is mostly predictable: to jack plugs for input and output; an input for your power supply; an auxiliary mini jack plug line in for connecting a backing track via MP3 player, phone or tablet; a mini jack plug output for headphones; and a USB output – more on that later. But one thing that stands out on the back panel is “control in” feature. What’s that about? 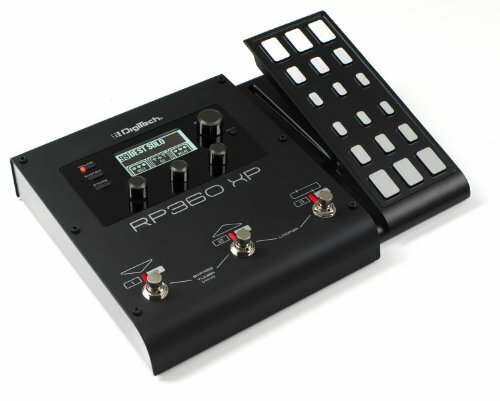 Well, if the foot-orientated controls on the RP360XP aren’t enough, this lets you extend it include a further footswitch or expression pedal device. The parts show a rugged construction, aimed at the gigging guitarist who needs a wide range of sounds at the tips of their toes, but without lugging around a bunch of pedals. Let’s see how they’ve been brought together. I’m a sucker for a good weighty piece of kit, and that’s exactly what the RP360XP is. Without even plugging in, it has a reassuring weightiness to it. There’s no doubt that the RP360XP was designed to be a rugged, giggable part of your rig. It’s probably not quite bulletproof, but it is certainly made to last. Unlike some of the cheaper, plastic-heavy multi-effects processors, aimed at beginners, this is for going beyond the bedroom. You don’t have to be so careful with being a bit heavy-footed with it, whether you’re dramatically stamping on one of the footswitches, or seriously laying into the expression pedal for a wah solo. The button placement and the general layout of the pedal is fine. There’s nothing that seems out of place or awkward. For the amount that’s packed into this little box, it feels like it’s punching above its weight. Looking at the list of features, I’m sure it does more than some units twice its size. With that ad its construction, Digitech have very much gone for the “small but mighty” approach. Of course, the most solidly constructed piece of kit isn’t worth anything without sounding good. Let’s see how it gets on with that. Always the most fun part of reviewing guitar gear. But this has so much going on, it’s hard to know where to start! 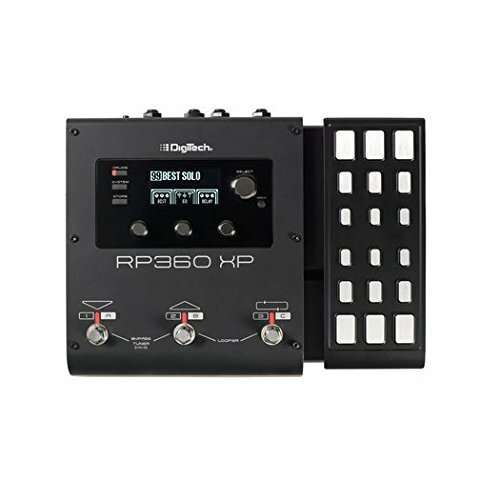 Digitech have split the effects on the RP360XP into seven different categories, from distortion to modulation to delay etc, with a further category for amps and cabinets. The LCD screen will show you what you’re doing as you apply the effects or amps. In terms of the inspiration behind the tones offered, it’s mostly the usual suspects on parade. The distortion category includes models based on the T9 and TS808 Tube Screamers, the Big Muff, and the Pro Co Rat, while there’s a chorus model based on Boss’s CE-2. Looking at amps and cabs, there are models included based on Marshalls, Vox, Fender, and Mesa Boogies. A solid selection based on some of the best amps around. If you’re going to do it, you might as well do it right, I suppose. The unit comes with 99 factory presets, to which you can add and take away elements of those as you like. It contains an additional 99 presets spaces for you to fill with your very own concoctions and creations. The emulations aren’t awful. Obviously, they’re digital recreations and will lack the charm and warmth of the original analog ones, but they’re admirable efforts. One of the things that makes multi-effects pedals so much fun, is the playability, and that playability is due to the number of sonic adventures that can be crammed into a single box. I mentioned the USB connection earlier in this review. Let’s take a closer look at that. It has a couple of functions. Firstly, it allows the RP360XP to operate as an audio interface. You can plug the unit into your PC or Mac to record directly into your digital audio workstation (DAW). This is probably the best use of the boutique amp selection. Secondly, it can be used for creating your own preset patches on your desktop or laptop. DIgiTech has a handy little piece of software for Windows and Mac called Nexus – not to be confused with Google products of the same name. If you don’t like the idea of hunching over your pedal, with its little screen, to create your patches, this will likely be a favorable alternative. After that, the RP360XP still has a couple of tricks left up their sleeve. It comes with 40 seconds of recording time with its built-in looper, as well as 60 drum machine patterns. There’s so much to keep an intermediate guitarist learning and experimenting. The market is awash with multi-effects units. If you like the ballpark the RP360XP is in, but it hasn’t entirely won you over, here are a couple of others you might want to look at. 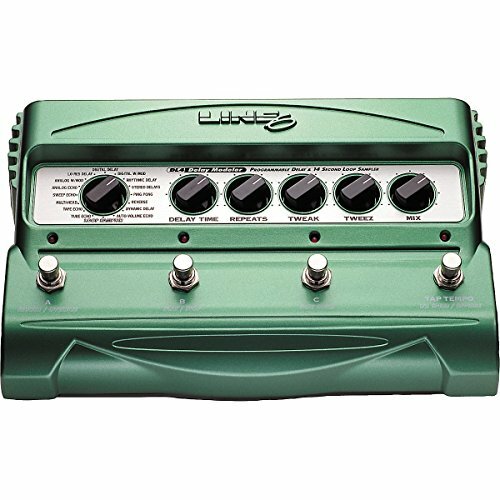 Line 6 are pretty legendary in the multi-effects. Their range of pedal dedicated to a certain class of effect, for example, the DL4 with its various delay emulators are always incredibly well-received. 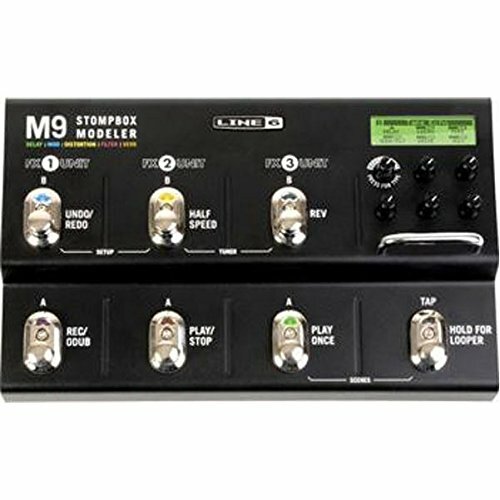 It doesn’t have a built-in expression pedal, although it does have a connection for such a device on its back panel. It also has MIDI connections, if you like that kind of thing. With its blue backlights, the BOSS GT-1 looks like it’s from Star Trek, so that’s always cool. On the off chance that you’ve never encountered BOSS pedal before, their best-known feature is for being built like a tank. Seriously, you can throw one at a drummer’s head and it’ll be fine. I find it interesting that BOSS has bothered included battery operation on this. It can be run off four AA batteries, which given the amount of work this would have to do, I imagine lasting until halfway through practice. It comes with 108 effects, 99 preset patches and 99 user patches, a 32-second loop length, and more patches that you can download for free. I’ve been very impressed with this offering from DigiTech. It’s really easy to sneer a bit at smaller pedals, but the RP360XP most definitely holds its own. Between the quality of its construction, and the range of tones available, an intermediate guitarist who can’t be bothered with a bunch of individual pedals should be satisfied with the sounds it produces. Purists will sneer, but realistically, if you’ve been playing for a few years, you know your chords and your solos, and you’re just doing some covers gigs at bars or parties, the audience will be more interested in the song, far more than how close to an original Tube Screamer your guitar really sounds. They seem pretty cool, but oddly, I never see reviews that actually mention how many effects can be used at once or if you can control their order in the chain. I see you can turn on or off 3 effects, but one has to wonder if that’s the amount of simultaneous effects you can use, or does it do more at once and simply allow you to turn on/off typical things like OD/Dist, Chorus/Flange, and Delay for different parts of songs? I think many would like to know that before purchasing one. I guess I could DL the manual to find out.. An ok, yet plastic, cheap, multi-fx is the G1xOn. It can do 5 at once in any order you like, though, the 5 at once is limited with some effects that require more processing power..i.e. you can’t always get 5 at once depending on which effects you are using. It has more effects in the chain, and you can directly control three at a time from the switches.